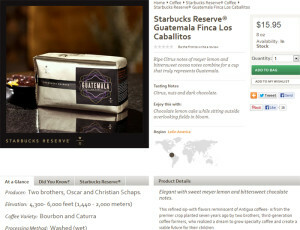 Right now, on StarbucksStore.com, there is a gem of an online-exclusive coffee: It is the Reserve Guatemala Finca Los Caballitos. Sourced from a single farm in Guatemala, there were not large enough quantities of it to offer to all Reserve Starbucks stores. I ordered a bag of it, and dashed to the East Olive Way Starbucks, enlisting the help of Coffee Master Jess for a mini coffee tasting. 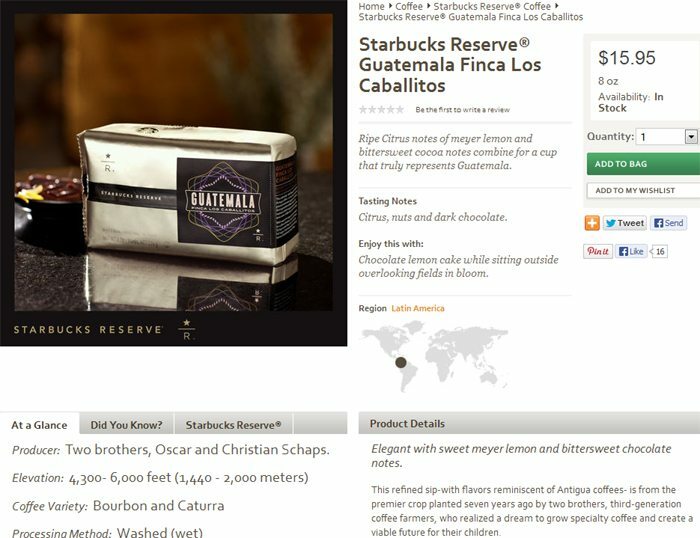 Click here to find the Guatemala Finca Los Caballitos on StarbucksStore.com. I have decided that I genuinely love an excellent single-origin, small batch Guatemalan coffee. 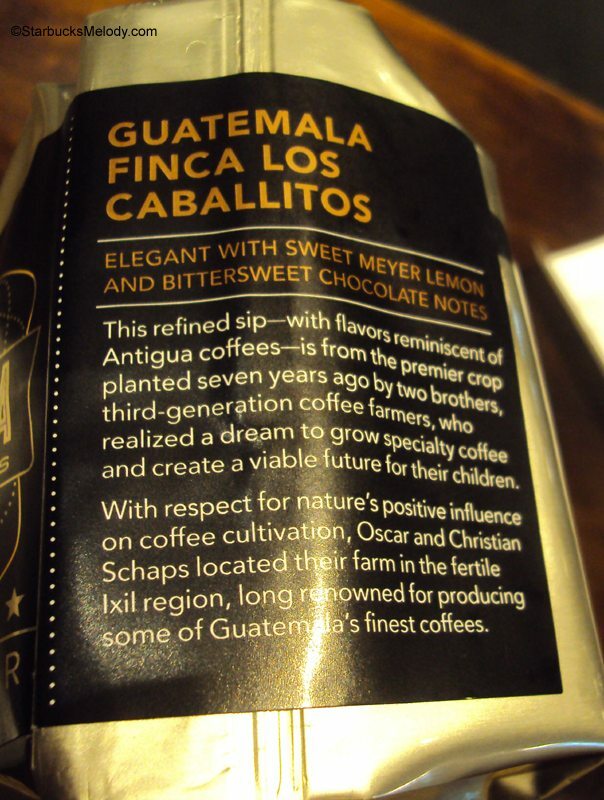 Lemon and dark chocolate notes are sometimes the hallmark of such coffees, similar to the flavor notes of the ever-popular Casi Cielo. This Guatemala Finca Los Caballitos is squarely a medium roast profile, and medium bodied coffee. 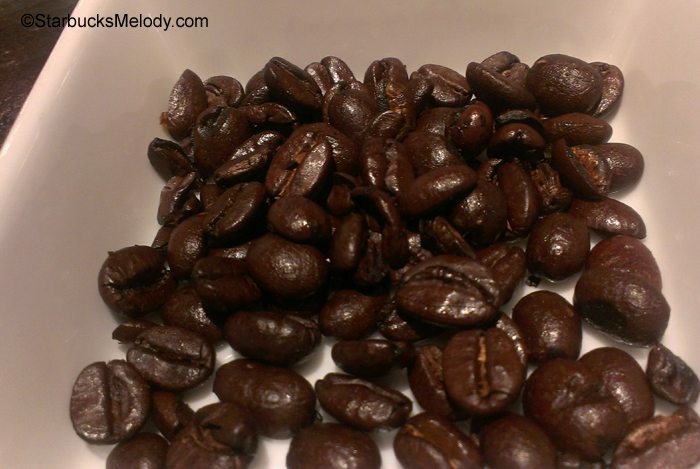 The beans themselves are deliciously aromatic with bittersweet chocolate aroma. I definitely got the lemon notes from the brewed coffee. Jess brewed this on the Clover on the same setting that would be used for the Guatemala Finca Medina coffee. 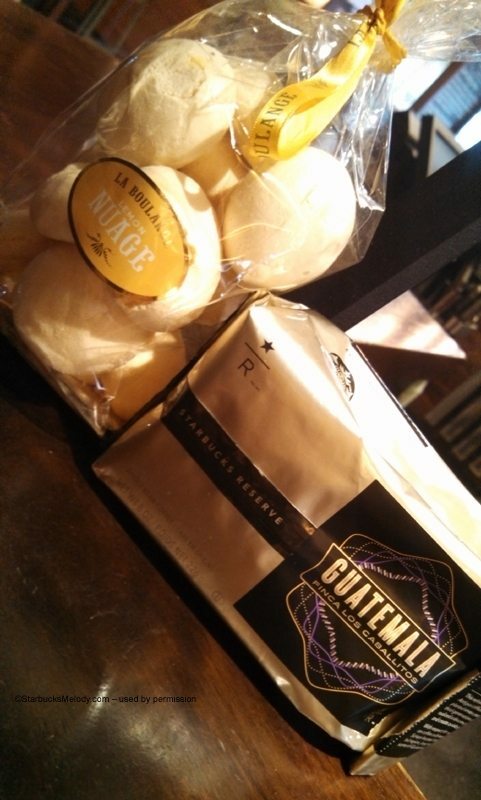 I enjoyed the Lemon Nuage cookies with the Guatemala Finca Los Caballitos. I thought that the lemon notes really came alive with this very lemony cookie. Jess had thought that the cookies were almost a little bit too sweet for this coffee, though I disagreed with her! 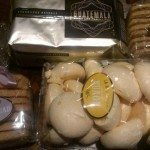 If you are in San Francisco and you can try these lemon cookies, you should! 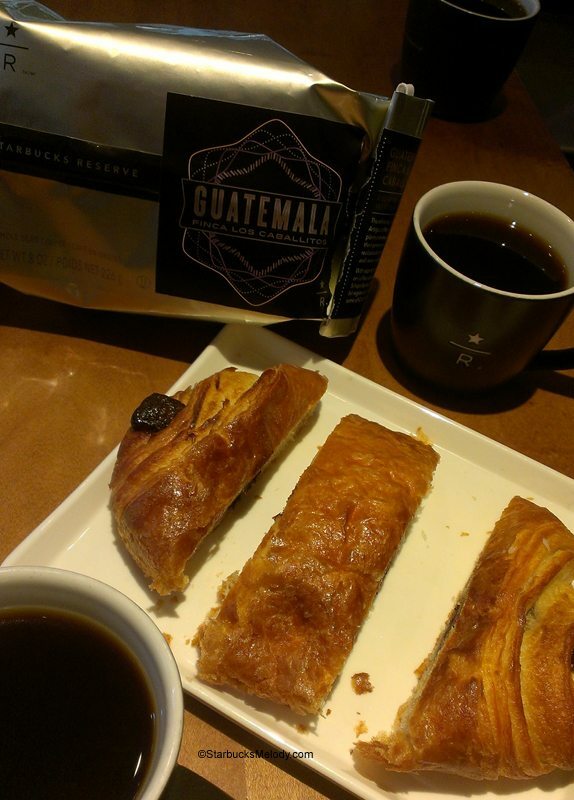 We noticed that this coffee has a little darker profile, and a little bit bigger body than the Guatemala Finca Medina, a current Reserve Starbucks offering. Paired with a Chocolate Spice Biscotti, it started out nicely with the chocolate notes pairing well with this coffee, but with spice notes overpowering it at the end. 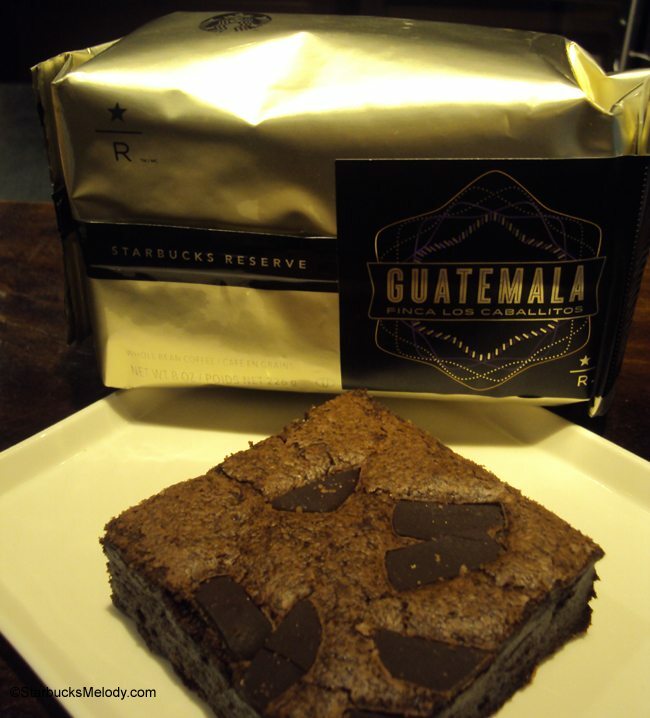 We also tried it with the classic Starbucks brownie, and I thought that was a fine pairing. It gave the coffee a little more creaminess to it. Basically, every cup of coffee that I have had from this coffee has been awesome. 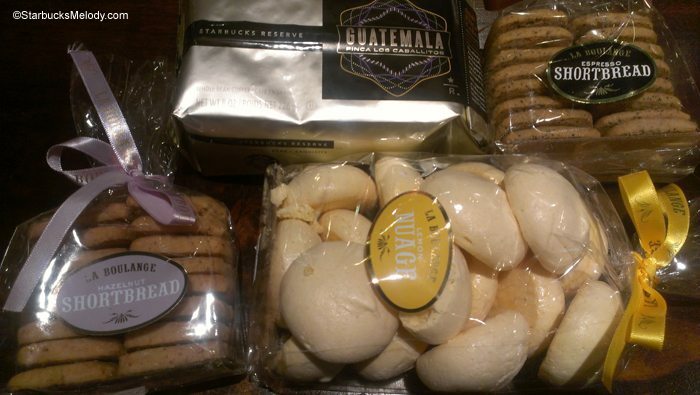 Today, (May 26, 2013) I took some Guatemala Finca Los Caballitos to the Fourth and Union Starbucks. 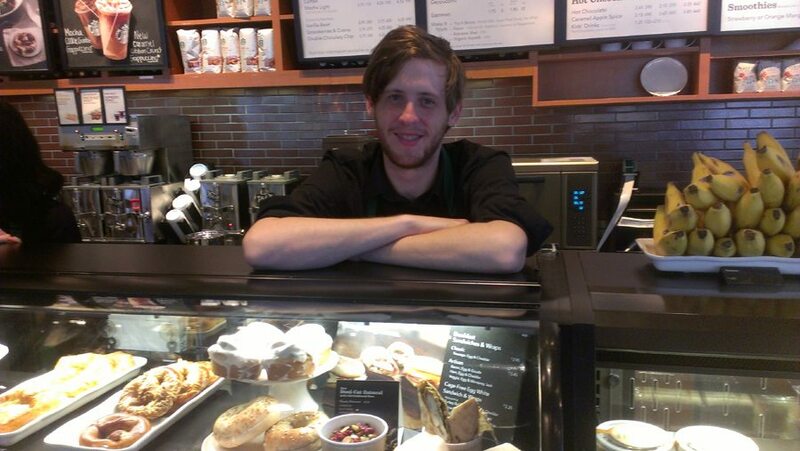 The shift supervisor, Mark, was eager to try it, and we had great conversations as I hung out at his store for a while. We paired this coffee with the chocolate croissant made by La Boulange – and I thought this was the best pairing yet. Definitely, a lot of chocolate notes came out in the coffee, and the buttery-ness of the croissant gave the coffee some fullness, somewhat diminishing its clean finish. 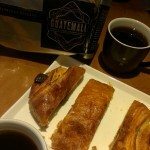 Here are some random photos from these two coffee tastings for Finca Los Caballitos – Thank you Jess at Olive Way Starbucks, and Mark at Fourth and Union Starbucks! As always, click onto the photos to make them larger. Sweden - A Starbucks in the Train Station. 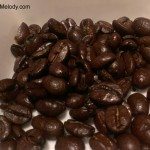 How many of these Starbucks coffees have you tried? 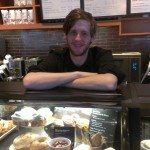 Coffee Journey: What is your store doing to inspire coffee passion? 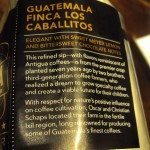 New Starbucks Reserve Available October 15th: Colombia Caldas. Faint lemon notes like Casi Cielo? Sold! Definitely ordering some now. This was a lot of fun! Thanks for the treats and the coffee 🙂 I love a good flavor profile challenge. @Jess – I had fun too! Thanks for doing this! Today I was connecting with my SM and DM so I had to conduct a coffee tasting. My DM has a very sophisticated palate and he has never failed to identify a coffee during a tasting. 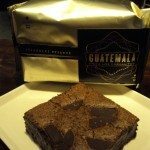 I chose the Finca Los Caballitos and paired it with a warmed double chocolate brownie. Wow! What an amazing coffee! The brownie definitely complemented the chocolate notes of the coffee. What I really enjoyed about this coffee was the crisp finish. There’s virtually no aftertaste with this coffee. I could smell the lemon notes but the taste was very faint in the finish. I am thinking that the brownie may have overpowered the lemon notes. I plan to try this coffee with the iced lemon pound cake to see how that brings out the lemon notes in the coffee. All in all, this is an outstanding coffee! Oops! I forgot to mention that I did stump my DM with this coffee. That said he really enjoyed the pairing and it was the first time I have seen him go back for more coffee during a tasting whether conducted by me or anyone else. @OrganicFairTradeDave – What a cool idea for a coffee tasting with your DM. I hope we get more Reserves like this one!